Bar Termini is an excellent Soho bar and cafe with a full negroni menu, great coffee, and classic craft cocktails. Very loud in there...which is fine, but not great on a first date...as sometimes difficult to hear what is being said. People ate literally shouting at each other on a Fri and Sat night. The best cocktails and coffee in town. Very small bar but with electric atmosphere. Cocktails are decent enough, but doesn't come close to living up to the hype or the pricing. Excellent cocktails in a lovely small bar with very attentive and knowledgeable staff. One of my favourite places in London for cocktails. We didn't eat any food, so the rating I had to give for food is based on what the platters other customers consumed looked like (cold cuts and bread from the look of it) rather than from my own experience. To confirm, I went to Termini for drinks not food so there was no reason why we didn't order any food. Extremely overpriced, tiny little "bar" with smelly toilets. My living room is bigger than this place! You should be ashamed of your prices, a 30ml (!? I'm only guessing, I do understand negroni is small though, but come on!) £8? Bill came down to £61 just for few drinks. Received a call three hours before the booking to be told I only had the table for 1 hour despite having booked almost a week in advance. 1 hour? This should have been made clear at the time of booking not late on a Thursday when everywhere else is booked. Disappointing service from an otherwise nice place that I won't be returning to. Great bar and amazing drinks! The staff were very friendly and attentive and the atmosphere was perfect. The espresso martinis in particular are delicious! Excellent cocktails. Friendly staff. Small bar, but you can book ahead so you know you'll get a seat. Great atmosphere and negronis as always! Took the in laws and they loved it! Amazing atmosphere and drinks as always. Even tony was there for a little bit. Friendly and helpful staff. Love this place, the detailing, the music, the tiny size. Pre-book if you can and arrive early. Cocktails and coffee... just brilliant. Pleased I went, nice service and pretty cool but a bit hectic and not somewhere to longer. These guys put forwrad some excellent (Italian) cocktails. Attentive service and a pleasant and chill vibe. Promised to seat us. After an hour inside drinking while standing by the door we realised the servers were making things up and were never going to seat us. Back again and it was a lovely way to start the evening. Great atmosphere and service. It was busy but did not feel over crowded. The cocktails were excellent if not a little pricey but I would recommend coming here. My time of place. Awesome cocktail bar. We went for a couple of drinks for my wife's birthday. The drinks were great but a bit on the small side and £10+ each. Awesome Ameretto Sour! Perfect as always. Best cocktails in town! Wish it was a little more spacious sometimes though. Brilliant cocktails and lovely staff, very tentative to us. I would recommend booking in advance. It's a testament to Bar Termini, that even though the bartender accidentally spilled a whiskey sour all over me, I still really enjoyed my time here. Great ambience and drinks. It's a very small bar and is ideal pre or post dinner for an hour or so. Lovely place for cocktails on a date. Friendly staff. Avoid sitting near the window in the winter though - there is a very cold draught! Good service, tight seating so you definitely need to book. We went there on Sunday at6. As we had booking , the table was ready. Otherwise we could not have enjoyed having drinks. Must have a reservation. Staffs there were very friendly and nice. The price was bit high. But acceptable. We like to go back again! Focus on digestives and apretives with some really good negronies. Attentitive service snd great ambience! I had high expectations for Bat Termini, which is a place that has garnered plaudits from the likes of Time Out. The evening was a disappointment, however. minutes we were let inside only to be made to stand behind the front door for another 5 minutes. We were then seated and orders taken. The drinks were very good. Strong (as cocktails should be) and subtle. I opted for a drink featuring clay and it was very very good. My partner has a Bellini which tasted great but was served in a small beaker, which detracted from the overall experience of the drink, which you would expect in a flute of something else more elegant. The prices weren’t cheap but weren’t extortionate. The experience was marred by two members of stay telling us to drink up and vacate our table when we had only been there less than 45 minutes. Given that we had been made to wait for 20 minutes for our table without apology or being served, it seemed a little cheeky to be rushing us out without letting us have a full hour at the bar. When we complained a waitress did apologise and offered us some complementary Limoncello, which we had to drink stood up next to the door. All in all, an underwhelming experience. Great drinks spiked by poor service. Staff were incredibly friendly and helpful. Authentic produce and drinks were delicious. Cosy setting - perfect date location. Great cocktails - classy outfit. Must visit! By far the best Espresso martinis in town. Make sure you ask for one! Staff are incredibly attentive and friendly. Very cute and intimate bar. Great staff! Offered tailored drinks off the menu. This place is atmospheric and cosy, and feels like a stylish Parisian speakeasy. But you pay for it and the tiny scale means there isn't much space between tables or people. We only tried the olives and snacks which were nice but again, pricey, but the food looked to be bread based - basically posh open sandwiches. This place is an ideal meet up for one drink or a good starting pre dinner drink on a special occasion. Wonderful as always! The service is impeccable, friendly and professional, and the cocktails are some of London's best. 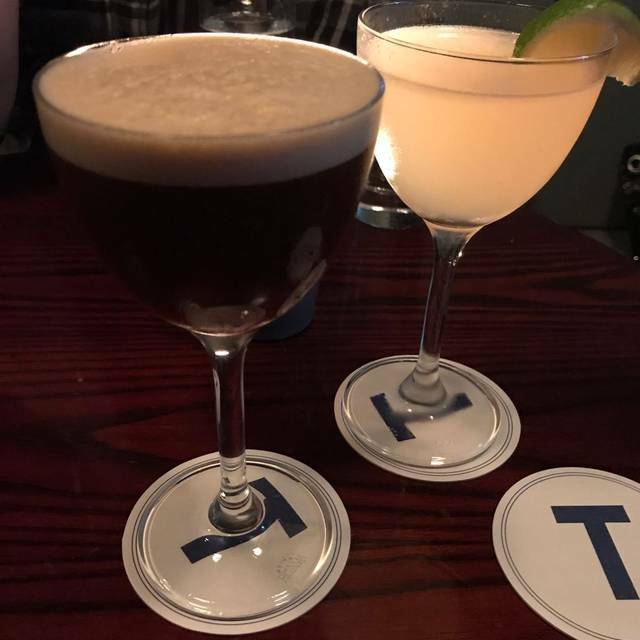 Try the off menu espresso martini, it's a delight. Tiny bar and I love that they only let in people they have space to seat. One of the very best cocktail bars in London. Incredible and knowledgeable staff, great drinks and enormous fun. I love going there. Didn’t eat BTW so can’t comment on the food, but I’ll surely try it next time!